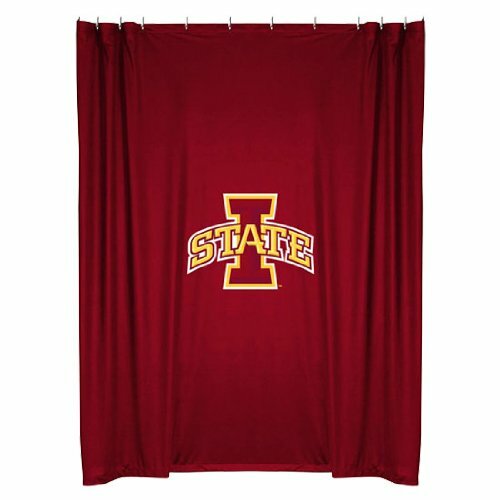 Iowa State Cyclones COMBO Shower Curtain & Valance/Drape Set (Drapes Size 82 X 63) - Decorate Your Shower and Bathroom Window & SAVE ON BUNDLING! This shower curtain is decorative and is intended to be used with a shower curtain liner. Louisiana State Tigers COMBO Shower Curtain & Valance/Drape Set (Drapes Size 82 X 63) - Decorate Your Shower and Bathroom Window & SAVE ON BUNDLING! Missouri Tigers COMBO Shower Curtain & Valance Set - Decorate your Shower and Bathroom Window & SAVE ON BUNDLING! Duke Blue Devils KING Size 14 Pc Bedding Set (Comforter, Sheet Set, 2 Pillow Cases, 2 Shams, Bedskirt, Valance/Drape Set (84-inch drape length) & Matching Wall Hanging) - SAVE BIG ON BUNDLING! Florida Gators COMBO Shower Curtain, 4 Pc Towel Set & 1 Window Valance - Decorate your Bathroom & SAVE ON BUNDLING! Arkansas Razorbacks - Set of (2) Printed Curtain Valance/Drape Sets (Drape Length 63") To Decorate Two Windows - Save Big By Bundling! Auburn Tigers - Set of (2) Printed Curtain Valance/Drape Sets (Drape Length 63") To Decorate Two Windows - Save Big By Bundling! Illinois Fighting Illini - Set of (2) Printed Curtain Valance/Drape Sets (Drape Length 63") To Decorate Two Windows - Save Big By Bundling! LSU Tigers - Set of (2) Printed Curtain Valance/Drape Sets (Drape Length 63") To Decorate Two Windows - Save Big By Bundling! Mississippi State Bulldogs - Set of (2) Printed Curtain Valance/Drape Sets (Drape Length 63") To Decorate Two Windows - Save Big By Bundling!